There are many bedding ideas that you can incorporate to achieve a rustic farmhouse look. From traditional to contemporary styles, select the right combination of pieces, fabrics and patterns to transform a farmhouse bedroom into your ideal retreat. The most expected bedding idea for a rustic farmhouse look is a quilt. Choose from traditional patterns, such as block patterns or more stylized ones, featuring a diamond-shaped center with matching pillow shams. 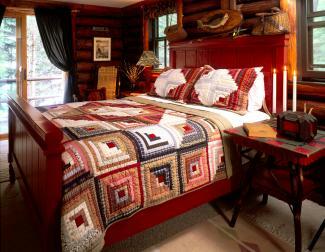 This type of quilt can provide the ultimate rustic charm for a farmhouse bedroom. Double wedding ring: This romantic pattern is an all-time favorite. The double wedding ring design features a series of colorful interlocking rings. Star block: There are many variations of this quilt pattern, such as star flower, Arkansas traveler and 7-pointed star. Jacob's ladder: This pattern has many names, such as Underground Railroad, gone to Chicago and covered wagon. The patches are set on point (squares turned to diamond-shaped angle) to form a row set between vertical stripes. Other patterns create a large multiple diamond-shaped ladder effect. Hexagon: This mosaic pattern is represented by two other patterns known as honeycomb and the stylized grandmother's flower garden. A quilt is the main focal point for this bedding design. Many quilt patterns also offer quilted pillow shams, but don't stop there. Add depth to your bedding choice with throw pillows, such as solid colors, stripes, checks and plaids. You can include some with ruffles to soften the overall look and repeat these with a ruffled bed skirt. For colder months, you can fold a blanket at the foot of the bed for easy access. Drape a throw over the foot of the bed for napping or reading in bed. A vintage bed becomes part of a shabby chic farmhouse design when layered with linens and pillows. Tiers of colors and patterns start with the bottom sheet and end at the bed throw. 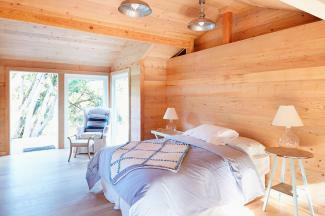 This bedroom design style is great for pre-teens or teens. Select a traditional pattern for the comforter, such as a small rose pattern. Fold a top sheet with a ruffled hem in a crisp white fabric over the comforter for a romantic flair. Choose a bold striped or checkered throw that repeats the colors of your bedding and fold it across the foot of the bed. Add ruffled throw pillows in a variety of prints, such as plaid, embroidered and floral. Alternate with plain pillow shams and throw pillows. You can transform a bedding ensemble with a simple technique - placement of bedding. For example, you can fold a quilt into a large square shape and then angle it on the bed in a way that shows off the pattern highlighted. For example, by positioning a quilt folded this way on the bed in a diamond shape, the pattern of stylized quilt squares will also take on a diamond shape. Using a reversible comforter turned down to reveal the underside pattern or print. Adding a bed skirt to create an additional layer of texture to further backdrop the quilt. Ensure your bedding complements the furniture you're using to create a rustic farmhouse look in your bedroom. For example, if you have an old iron bed and chest of drawers that is painted a dusty rose color, look for bedding that allows you to mix colors and patterns in a unique way. Bedding with a geometric design and reversible comforter is ideal when you're using the strategy of mixing colors and patterns. A reversible comforter with a different color but same pattern on the underside is a great way to layer without the expense of buying a coverlet or throw. Simply fold back the comforter to reveal the contrasting color. 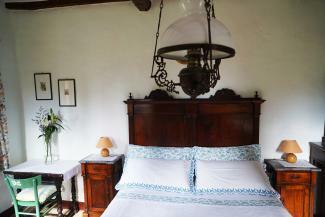 At the headboard, stack pair of shams in the same design but different colors. Consider one dusty rose (to match the chest of drawers) and a blue one to match the secondary color of the reversible comforter. Add a pleated or other textured white or solid colored pillow to complete the pillow stacking. If you have antique or replica style bedroom furniture, you can create a great contrast between dark finishes and rustic antiquity with light-colored and delicate floral bedding. Change your bedding during the winter season, using heavier fabrics and more layered bedding when nights turn colder. During summer months, opt for lightweight bedding, such as thin cotton sheets in a small floral pattern. 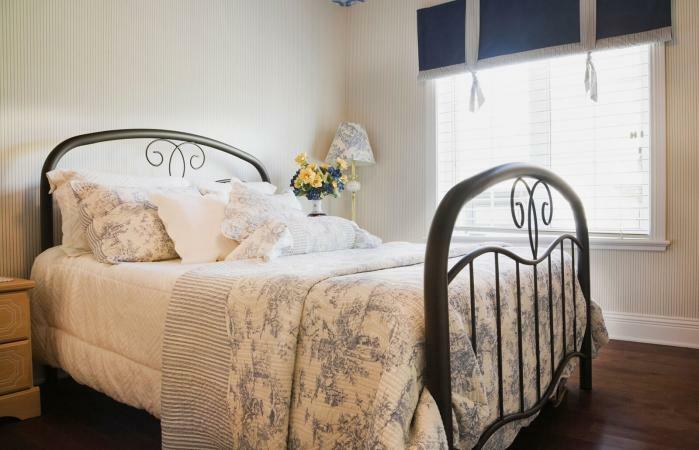 Choose a lightweight coverlet that can be folded at the foot of the bed when not needed. 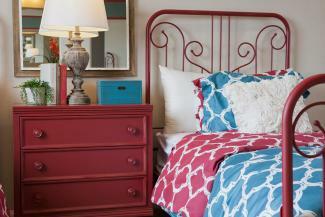 Consider using various patterns and colors in your bedding design to mix and match. Layer enough bedding textures to achieve a great rustic farmhouse look.